The value of all 11,953,475 bitcoin surpassed the $3bn mark today, based on the Mt. Gox high of $258.88, before pulling back to $237. Based on Bitstamp’s high of $250.79, the total value, or market capitalization, was still a few cents away from $3bn, and Bitstamp pulled back to $235.10. Additionally bitcoin prices at the fast-growing BTC-China exchange reached 1,500 CNY. Bitcoin has received a great deal of media attention recently in Chinese newspaper and television with the country’s largest search engine, Baidu, now accepting the digital currency. Nonetheless, this is a big development when media articles about Bitcoin frequently quote the value of the market in the range of $1bn to 1.5bn. The Wall Street Journal blog mentions that a pair of U.S. Senate committees are to hold hearings on policy issues raised by “virtual currencies” in the coming weeks, according to Senate aides. The aides also mentioned that the first committee would specifically discuss Bitcoin, and would likely examine how regulators are responding to the new forms of payment. Other concerns could be the usage of digital cash in illicit activity as well as the May report of the Government Accountability Office which highlighted the potential loss of tax revenue. NPR’s Here and Now program also discussed digital cash this morning. 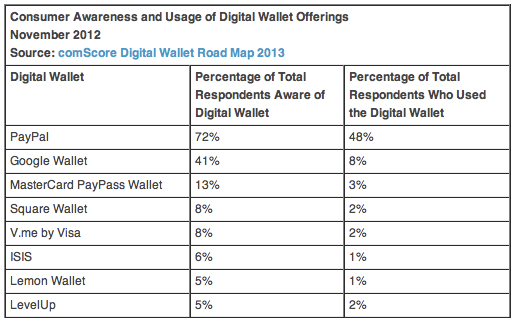 The segment titled, “Digital Wallets Not Yet Up to Snuff”, highlighted Comscore’s Digital Wallet Road Map 2013. Based on surveys conducted in late 2012, the service with the highest proportion of users familiar with digital wallets was, unsurprisingly, Paypal, and nearly half of respondents actually used the digital wallet as well. The full chart is shown below, but it does not appear to have covered Bitcoin users. In the interview, CNET’s Executive Editor Roger Cheng primarily criticizes the shortcomings of private company offerings from the broad-based Google Checkout to single-store usage of the cards and apps of retailers like Starbucks and Dunkin Donuts, which creating their own systems tied to a combination of digital wallet and loyalty program. Nonetheless, he claims Paypal’s first-mover advantage has made it the leader in the field, even as it’s somewhat limited to eBay and a few other merchants who use it. Based on the recent blitz of media coverage of Bitcoin, the same survey conducted today would probably show a majority of respondents are also familiar with Bitcoin, though probably much less than half would have used it yet.